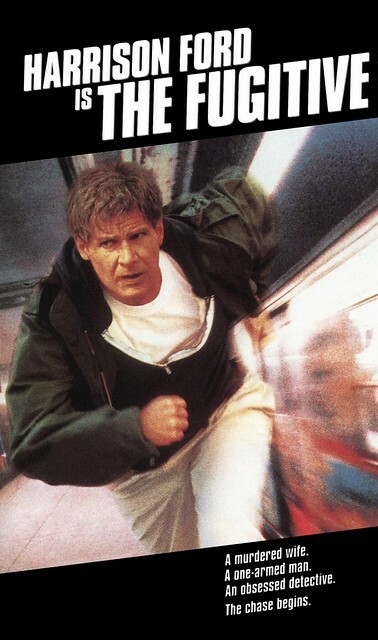 The Fugitive is an excellent movie starring Harrison Ford as Dr. Richard Kimble, a prominent Chicago vascular surgeon, who comes home one evening to find his wife brutally beaten and shot. Still in his apartment is the killer, a one-armed man, who fights with Dr. Kimble and then flees. Asserting that they are unable to locate the alleged one-armed man, the Chicago Police Dept. builds a solid case against Dr. Kimble; he is brought to trial and convicted. As he is transported to prison, the Menard Correctional Center in southern Illinois, another prisoner attacks a guard and the ensuing disruption causes the bus driver to get shot. This in turn, causes the bus to crash, landing on train tracks. Of course, the track is active, a train is coming and crashes into the bus. 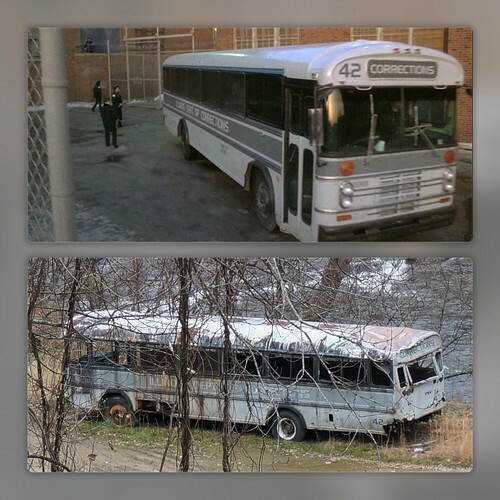 Kimble’s escape from the bus wreckage is of course, what starts the action of the film in motion, and serves as the entire basis for the film’s title, as Kimble becomes a fugitive, being sought by U.S. Marshals led by Tommy Lee Jones as Deputy Marshal Samuel Gerard. 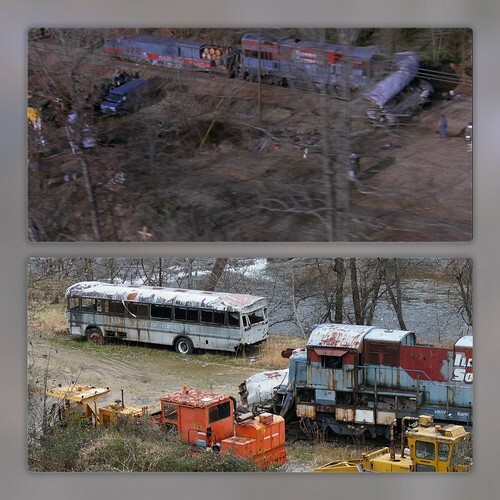 In the film, the bus / train wreck scene is depicted taking place “20 miles from Menard” where the prisoners were being transported to the correctional facility. Subsequently, the U.S. Marshals reference area locations, such as the nearby town of Chester, as well as I-55, I-57, I-24, and State Route 13, where US Marshal Sam Gerard recommends checkpoints. 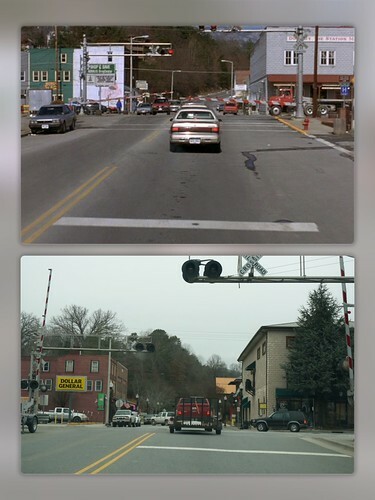 However, the train crash actually took place in Dillsboro, North Carolina and is still there, deteriorating. It is often noted how the area of the Smoky Mountains scarcely resembles southern Illinois. The article I posted below gives more insight as to the filming of the crash and also why North Carolina was selected. Here is a video of the the entire bus/train wreck scene. Here is an interesting article from the L.A. Times, published in August 1993, the summer the film was released: A look inside Hollywood and the movies. : How Did They Do That Train Wreck? The location of the bus leaving the jail is actually a school in Chicago. However, I am adding the screenshot to compare the bus to the one in North Carolina at the bus/train crash scene. Here are several screenshots along with my photos of the location. One of my favorite lines from the movie. Once it is determined that the prisoners are not all dead (one of the Marshals discovered sets of leg irons with no legs in them), Gerard immediately orders a search. One of my favorite scenes from the movie, and the best line from Gerard (the doughnut with sprinkles is probably my second favorite). Alright, listen up, ladies and gentlemen. Our fugitive has been on the run for ninety minutes. Average foot speed over uneven ground barring injury is 4 miles an hour. That gives us a radius of six miles. What I want out of each and every one of you is a hard-target search of every gas station, residence, warehouse, farmhouse, henhouse, outhouse, and doghouse in that area. Checkpoints go up at fifteen miles. Your fugitive’s name is Dr. Richard Kimble. Go get him. 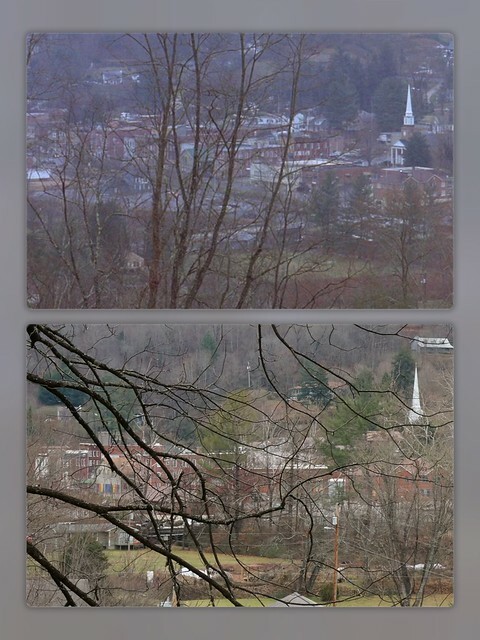 Several scenes (all in relative sequence) were filmed in Sylva. 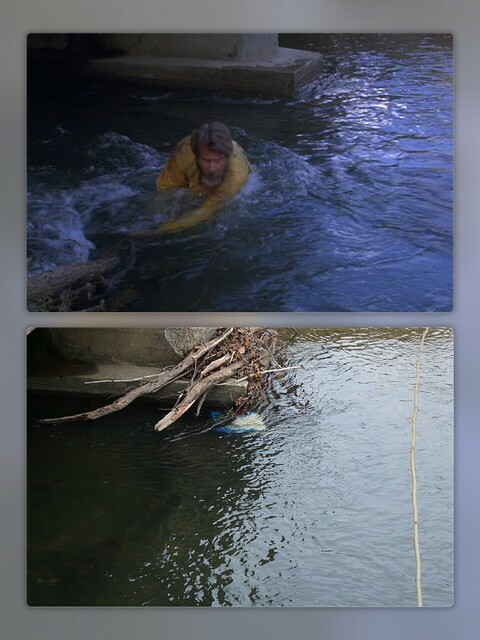 After escaping from the train wreck, and wading through a creek, Dr. Richard Kimble spots someone leaving a mechanic’s uniform in an open, unlocked truck and takes it to change from his IDOC (Illinois Dept. of Corrections) jumpsuit. 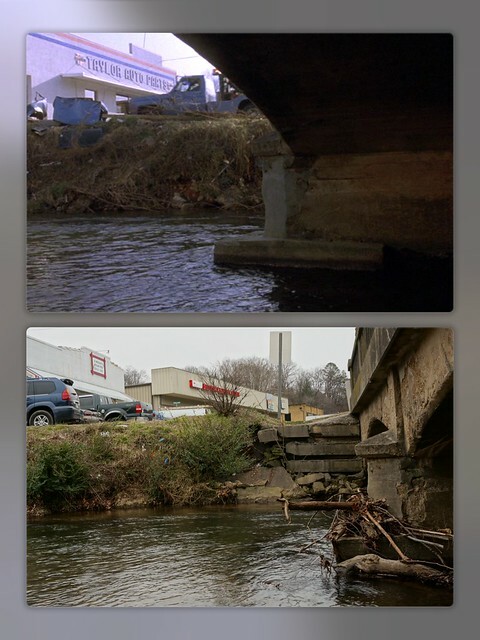 This location is along Business US 23 in Sylva, at a bridge over Scott Creek. At the time of the movie, the location was a Carquest auto parts store called Taylor Auto Parts. It is now a Hispanic market. Looking down into Scott Creek from the parking lot of the market. 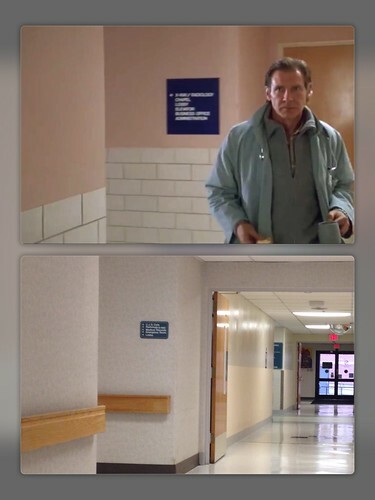 Dr. Richard Kimble sneaks into the hospital by unloading boxes from a loading dock. 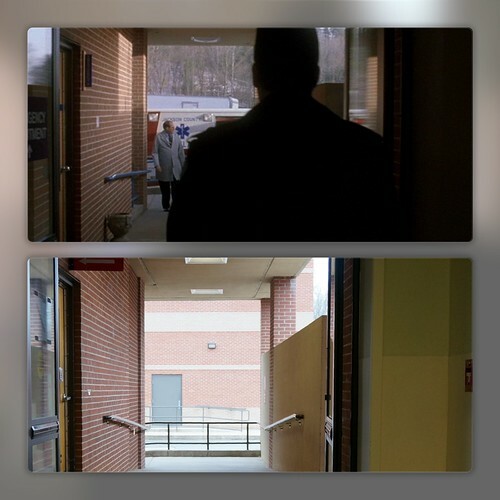 Filmed at the Emergency Room entrance. Below, Dr. Kimble accesses a treatment room at the hospital to treat his injuries from the bus crash. 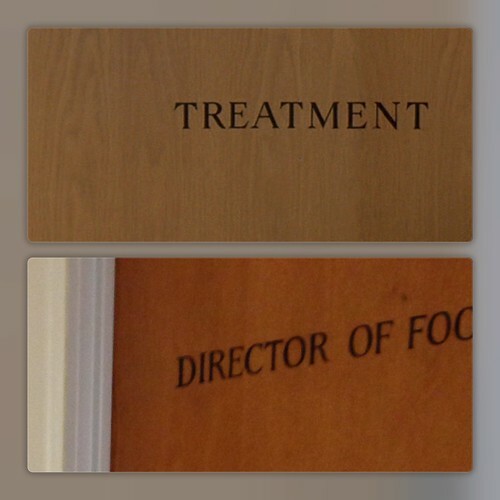 The top image is from the movie, the lower photo is a partial photo of a door in Harris Regional Hospital (I guess the director of food service), where the lettering is the same as it was in the film. A State Police Officer arrives at the hospital to notify staff to be on the lookout for Dr. Richard Kimble, who they believe may go to the hospital seeking treatment for injuries in the bus/train wreck. 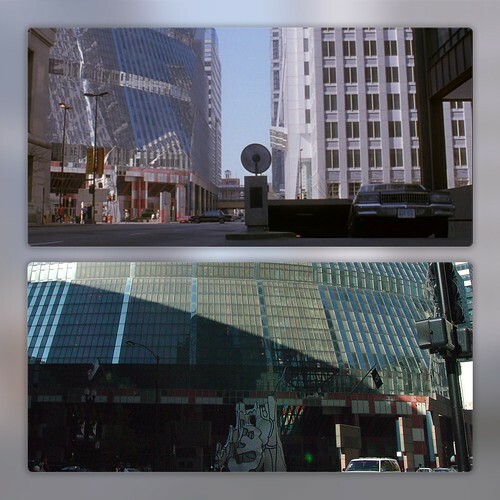 As with most buildings, there have been some additions and renovations since the time of the movie. 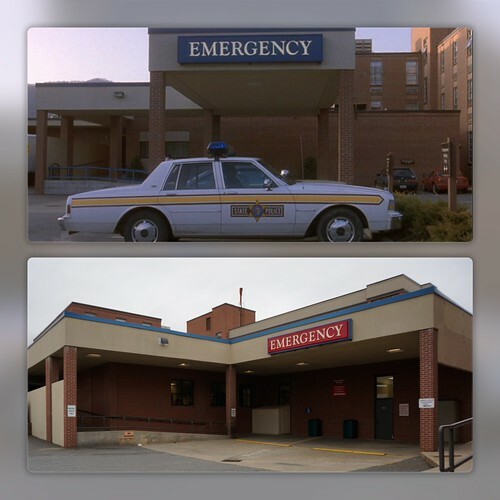 If you look closely enough, differences in the emergency room entrance are obvious (we were there and it was confusing!). There is an addition where the state trooper’s car is parked; you can see where the old “EMERGENCY” sign was along the canopy on the right side. 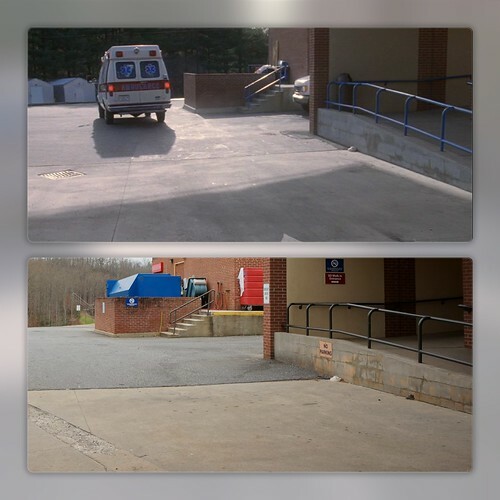 The loading dock area (just slightly visible to the left) is the same today, and the Emergency Room entrance and rail is the same. After treating his injuries, Dr. Kimble shaves his beard and is trying to leave the hospital. 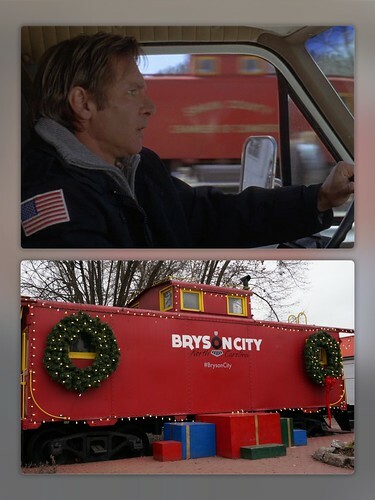 Area law enforcement has been notified of his escape from the prison bus, and all area hospitals have been alerted to be on the lookout for him. 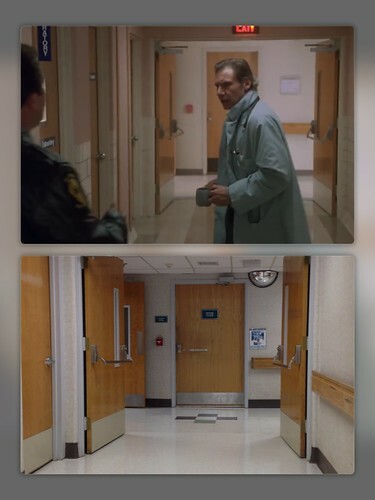 These scenes were filmed in the hospital’s interior. Prior to the trip, I hadn’t actually planned on photographing these scenes (nor did I with the emergency room either, for that matter). 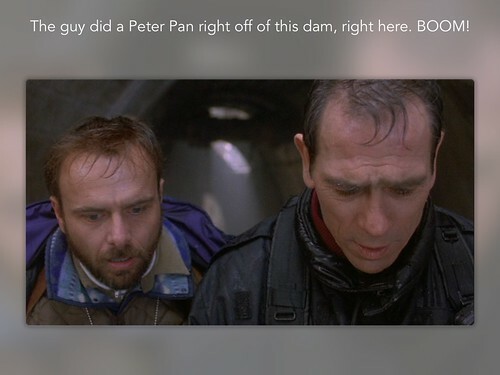 I had no screen captures, but as we stood in the corridor, knowing the scene from having seen it a million times, I knew I was in the right place. We (barely) managed to watch a video of the scene to assist us. The double door was closed in the movie, but we were in the correct corridor. Kimble encounters the State Trooper, who asks him if he’s seen the fugitive from the train crash. From the interior of the emergency room area looking outside, where the loading dock is on the right and the ambulance area is on the left. Dr. Kimble sees an ambulance arrive, and assists the EMTs, who are transporting an injured correctional officer who was on the bus and was stabbed by one of the inmates, which caused the fracas leading to the bus crash. Kimble and the officer recognize each other as the officer is whisked into the hospital by the EMTs. Kimble immediately goes into his next method of escape, stealing an ambulance. Here he is leaving the emergency room area at Harris Regional Hospital in Sylva. Dr. Richard Kimble drives the stolen ambulance to escape the U.S. Marshals. 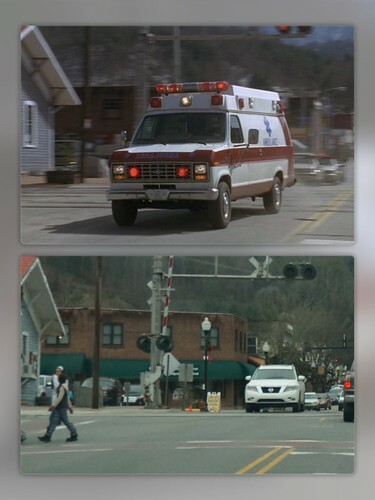 This scene was filmed along Everett Street in Bryson City, North Carolina. Along Everett Street in Bryson City. 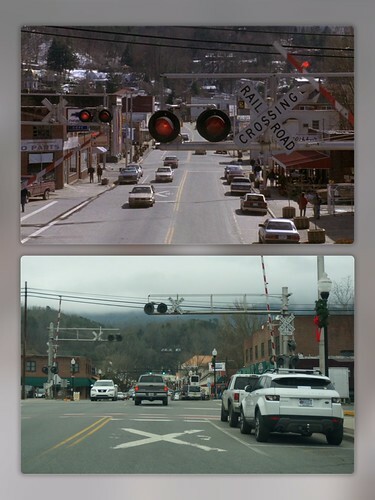 The Bryson City train depot is on the left. Dr. Kimble drives the stolen ambulance into a tunnel nearby a dam to escape the pursuit of the U.S. Marshals. 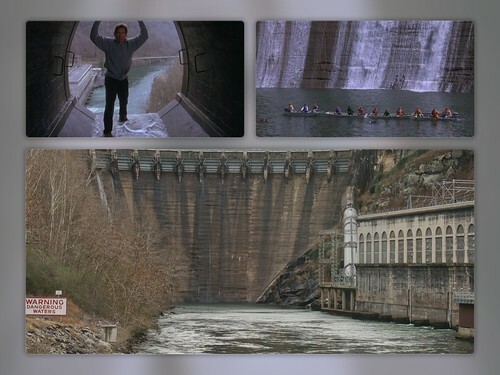 The screen shot from the movie above is actually a composite – the road next to the dam does not lead to a tunnel. I have read that the tunnel is located somewhere along the Blue Ridge Parkway, so I might have to look into that sometime. 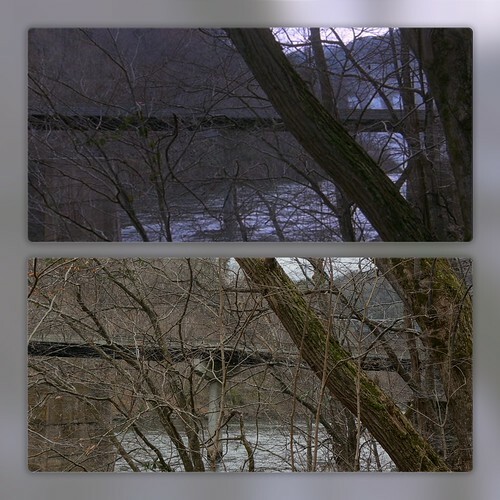 The chase scenes were supposed to be along the BRP as well. We didn’t do a lot of research on those locations this time, but may modify this post in the future if we can find some of them and take a trip there. 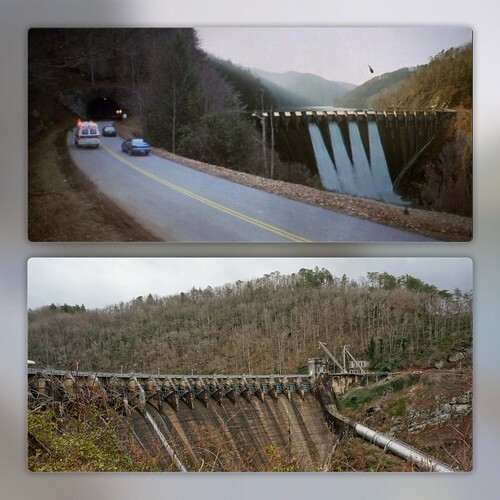 The exterior scenes of the dam were all filmed along US 129 in North Carolina, at the Cheoah Dam. After being chased to the top edge of the dam by the U.S. Marshals, Dr. Richard Kimble leaps from the dam. Several composites were done for the film. The tunnels where they chased Kimble were all done in Chicago. In the screenshot below, showing Kimble in the mouth of the dam, the area behind Dr. Kimble shows US 129 just west of the dam. 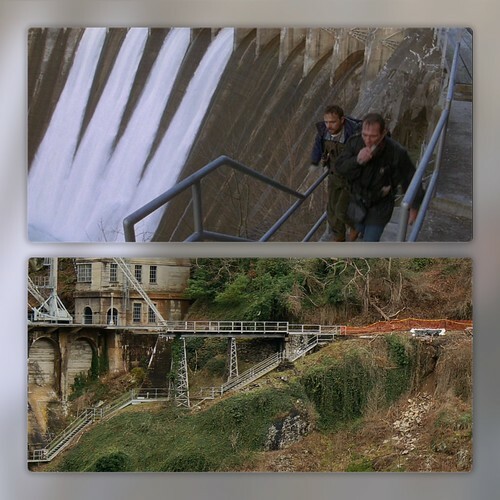 The dam has no wide mouth openings like the one where Dr. Kimble is standing, but if it did, the scene looks very accurate! 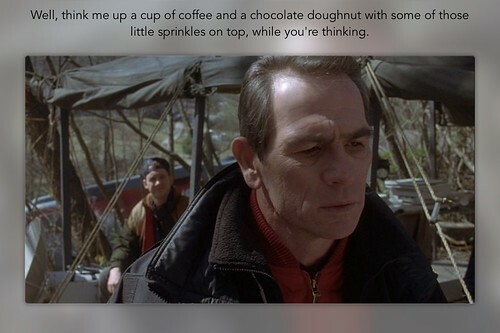 Yet another classic line by Tommy Lee Jones, most of which was ad-libbed. US 129, just west of the dam, visible in the background. It more prominent in the film, because the gates were open for plot purposes. Chicago, Illinois – the U.S. Marshals leaving their parking garage. I hope you enjoyed what I have so far. I hope to get to Chicago and take some photos up there. This entry was posted by Jennifer on January 11, 2015 at 5:30 pm, and is filed under Filming Locations. Follow any responses to this post through RSS 2.0.You can leave a response or trackback from your own site. 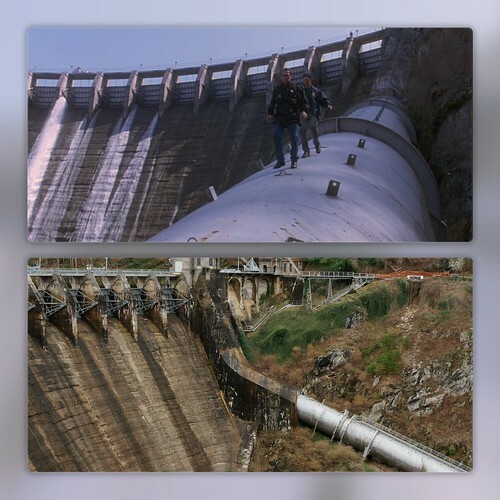 Thanks for this, just watching again for the millionth time, when in the helicopter and chasing the ambulance, I heard Gerard say “Barkley Dam” so I wondered where they were because I goto Barkley regularity and I know the dam in tunnel could not be that steep.